What an amazing job Rankin's publishers have done for him during his New Zealand tour last week. I can't recall when a visiting author last received so much attention and coverage from the media. He deserves such coverage as he is a rock-star in the book world and a bloody fine writer too. SUSPICIOUS? Best-selling Scottish crime writer Ian Rankin told a Christchurch audience his first attempt to do research landed him as the prime suspect in a serial murder case. One of the world's best-selling crime writers has told an audience of several hundred that his first attempt to do research landed him as the prime suspect in a serial murder case. 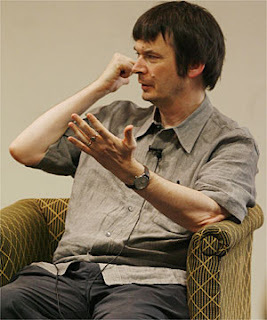 At a function in Christchurch last night, Ian Rankin said: "I didn't know anything about the police so I went to the police station and told them I'm writing a book. "I gave them the plot, not realising they were investigating a crime that was almost identical. "They said, 'Why don't we pretend you're a suspect?' After 1½ hours they let me go. I was the only suspect in a missing person case that ended up with seven victims." The real killer was caught in a coincidence - a stone caught in a lawnmower - that Rankin said would have been rejected as outlandish if he had written it in a book. However, Rankin also warned that, like his father, he was"for ever telling lies ... you have to take me with a pinch of salt". Twenty years on, after the original books barely sold enough to keep him on contract, Rankin has now sold eight million books in 31 languages. Unlike Rankin, his creation Rebus now faces retirement. "I don't get a rest," Rankin explained. "I'm writing a libretto for a 15-minute opera which is set in Italy and begins and ends with a bloodbath." Footnote: To read Bookman Beattie's review of Exit Music click here. And to read Roger Hall's account of Rankin's North Shore meeting click here.